When I started working for Burt Hill, everything seemed great. We were so busy we could not hire enough people to keep up with the pace. This was less than 2 years ago. When I came back to Pittsburgh to accept a full-time position this past summer, the International site group had more than doubled and we were moving to a brand new International Studio floor to spread our wings. Things were great and we were hiring more new people for the International Studio as recently as October. In ways I saw this coming, but not to the extent that my job would cease to exist and possibly the International Studio altogether. Dubai was growing unchecked, but we were getting so many new projects and working towards regular deadlines the end did not seem eminent. Did I agree with everything we were doing there? No, but it was a paycheck and we were working on some amazing projects. My initial plans were to work for a few years and work towards becoming a registered Landscape Architect. I did not see myself working for Burt Hill my whole life, although when it was good it was a great place to work. I enjoyed the people I worked with and working downtown had several endearing qualities. I could ride the light rail to work. I could see each of the stadiums from my office. We had a pool table on our new floor (which I never played). We had a softball team. All things that many other firms have, but I liked where I was at for the time being. Dubai as many of you know had become a fantasy land. They were building anything and everything. Recreating locations of the past in the desert. One project was directly modeled after Bath, England. Dubai wanted to be everything to everyone. Bigger, brighter, and more expensive seemed to be the goal. In an email circulated in June chronicled Dubai’s construction conquests. The following images are a few of the highlights. Those same four buildings are still in the picture, but look at the change its utterly insane. No other city in the world experienced this type of construction boom over the same time period. The Burj Dubai is the tallest building in the world reaching heights of 818m. It stands close to 40% taller than the current tallest building in the world, the Yapei 101. Many projects have slowed down or halted entirely. The Burj has still not been finished, but remains under construction. The Al Burj was to be the world’s next tallest building reaching into the sky 1400m. That is 1.4 kilometers. How does a building like this function? Elevators are essentially minature space shuttles. Using boosters just to make it up the shaft. To date the Al Burj has not started construction. We have talked about Nahkeel’s troubles before. What I am getting to is this. Dubai has become a ghost town of sorts. When things were good, many people mortgaged their lives. The economy is crashing and these ludicrous buildings and islands are going to stand as relics and reminders of what not to do. It seems that greed clouded many people’s decisions, which is all too often the case. It is a sad state affairs because of the damage that has been caused not only to people’s lives, but also the environment. The World islands are already under construction, but at this time it is doubtful that they will ever be developed. With all of the off shore construction in Dubai I doubt that there is any life in these waters. Most islands are formed naturally, but these were manmade. Extensive breakwaters had to be constructed to protect the World slands along with the three other Palm islands. My question is who will live here? Why would you live here? People are fleeing in alarming numbers, leaving their vehicles at the airport. 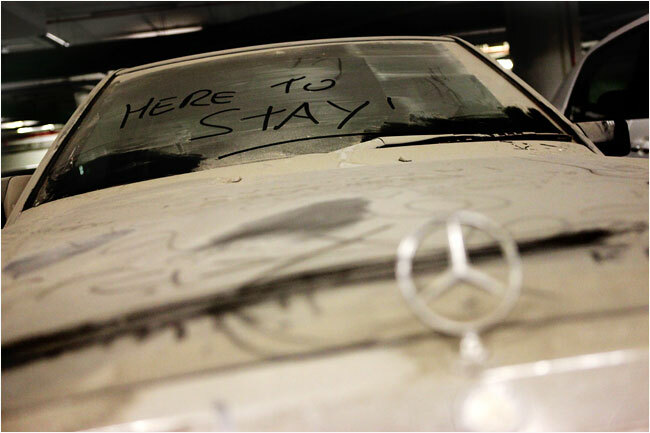 A car abandoned in a Dubai parking garage. Courtesy of the New York Times. Many are leaving out of fear because they have maxed out their credit cards and cannot afford payments on their newly purchased homes and cars. The credit crisis in the U.S. pales in comparison to what is going on in Dubai. Expatriates are leaving in droves. Dubai may not fail to exist, but it surely has taken a hit. What has gone on in Dubai and worldwide should serve as a lesson in growth. When everyone is sitting back collecting a check, instead of asking the questions they should things do not go well. Smart growth for nations and states needs to become a focus and living within our means should be a requirement. The U.S. suffers from its own unchecked growth. Urban Sprawl. That will have to wait for another post. Such a gorgeous city and incredible what they have done – just too much too fast? The world’s economy certainly has not done the city any favors. I wonder if this will put a halt to Kuwait’s proposed enormous super-city, Madinat al-Hareer? Like Dubai, it’s being built completely from the ground up and they’re looking for total completion within 25 years. This city would give Dubai a run for its money (and the proposed building would beat out Burj Dubai by a good 200 meters). This is going to be some Biblical-type lesson that we’re going to experience with our irresponsible credit. I’m waiting for the locusts any day now. Lights, Glamour, Amazing world class construction, Best shopping hubs are all adjectives for Dubai. However I think it is our sheer ignorance that we praise any of such establishments. I think the correct adjectives would be socially unsustainable, irresponsible, humongous but disastrous. A very, very interesting and informative post. Thanks.